1) Liyana sounds like such a unique character , what can we expect from her? Liyana is destined to sacrifice herself so that her goddess can inhabit her body and use it to summon the magic that will enable her clan to survive the harsh desert. She doesn't want to die, but she's willing to, in order to save her family, especially her beloved four-year-old brother. She's fearless and practical and always trying to do what's right... even if it's not clear what "right" is. 2) The idea that someone could house a god or goddess is fascinating, what was your main inspiration behind the plot? I'd been toying with the idea of a deity possessing a human for a while -- the idea grew out of musing about extreme magical powers -- but it wasn't until I had the idea that this possession would necessitate the death of the human's soul that the story for VESSEL really clicked into place. 3) Who was your favorite character to write about and why? Were there any characters that were difficult to write about? I loved writing about Korbyn, my handsome trickster god who walks out of a sand storm to save Liyana -- because he needs her to save his world. 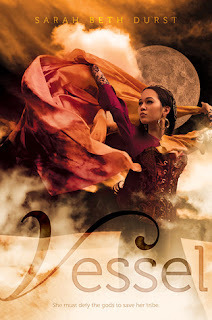 Writing the goddess Bayla was a little tricky for logistical reasons that I can't explain without spoilers, but the difficulty also made her a lot of fun to write. Suffice it to say, she's not pleased with some of the choices her vessel makes. 4) Tell us a little about that gorgeous cover. The cover was created by photographer Jaime Ibarra and the Simon & Schuster art department, and I am absolutely in love with it. It captures Liyana's strength and the rich beauty of her desert so perfectly. I saw a blog post from the photographer with photos of the cover shoot. They painted those tattoos (which are important in the book) on the model, and they hired a coach to teach her how to whoosh the fabric so it would look in motion. 5) Give us 5 reasons why we should pick up VESSEL (although we probably already will with the amazing cover and summary). 6) If you could be a vessel to any god/goddess, do you have one in mind that you might let "borrow" you from time to time? If it could be temporary... probably an earth goddess of some sort to heal the bits of the planet that we humans have damaged. 7) Are you currently working on another book or series we can look forward to? Yes! I'm currently working on my next YA novel, SWEET NOTHINGS, which is about a girl in the paranormal witness protection program. It's coming out in fall 2013 from Bloomsbury/Walker. I also recently sold my first books for adults to Luna: THE LOST, THE MISSING, and THE FOUND. Liyana is a girl in an unusual situation. She is never meant to live her own life or follow her dreams. Instead, she is merely a vessel for another god or goddess to inhabit. Her goddess is meant to bring prosperity to her tribe and relieve tribes from the drought and famine; when her goddess doesn't inhabit her body during the ritual, Liyana is cast from the tribe. Alone and determined, Liyana decides that she should try to live. When Korbyn tells her that her goddess is in need of a rescue and that other gods/goddesses have been missing too, Liyana once again rises to the occasion. The more Liyana gets to know Korbyn, the less sure she is of giving up her body. Is her tribe more important than herself? Liyana's character was phenomenal. She was so easy to love and root for; the reader will likely not want Liyana to make way for a goddess. Her selflessness and generosity is overwhelming when the reader thinks about giving up his/her body to a god/goddess. Korbyn's character provides comedic relief and gives Liyana's character the determination to push forward. Raan is so raw, her character is infused with strength. The other characters include both vessels and love interests; all are created carefully and are dynamic. There were a few characters at the end that felt a bit rushed and I would have wanted to get to know them better, but overall the characters themselves make this book a must-read. The setting for the story is unique. Author Sarah Beth Durst manages to paint a magical picture of a desert setting where wolves are made from sand and salt worms can kill or maim people. The landscape sounds so enchanting and surreal, but the author makes everything easy to imagine. The rich traditions the tribes uphold are interesting and add a certain element to the book. Between the plot, characters, and setting, this book is highly recommended to young adult/teen readers. Vessel sounds like a really interesting book. Thanks for the great interview! This is one of my favorite books. It is stunningly beautiful, with amazing world-building, such fantastic characters, and a fast-paced plot. It was beautiful in every way! Sweetest Taboo Guest Post and Giveaway! Concilium Book Blast and Giveaway! Book Blast: Freedom Road Giveaway!!! Demons Blog Tour: Guest Post! God Loves You-Chester Blue Book Blast Giveaway! Awesome Harper Collins Giveaways and Apps! Carnival of Souls Twitter Party!